The Helms Burton Act was entered into force in 1996. It was conceived to codify and tighten the economic, commercial and financial blockade policy officially imposed in 1962 with the purpose of subverting and overthrowing the Cuban government and imposing a regime to the liking of the US government. It consists of four titles and has been implemented since its enactment. It is characterised by having an extreme extraterritorial scope, violating the rules and principles of International Law, contravening the rules of trade and international economic relations and being harmful to the sovereignty of other States, particularly because of the implementation of its provisions against companies and individuals established in their territories. This Act has been rejected almost unanimously by the international community at the United Nations, specialized international bodies and regional organisations, such as the Community of Latin American and Caribbean States and the African Union. Several countries have passed their own national laws to cope with the extraterritorial effects of this Act. Title III authorises US nationals to bring action before US courts against any foreign citizen that is “trafficking” in US properties that were nationalised in Cuba in the 1960’s by means of a legitimate process, as was recognized by the US Supreme Court, that was carried out by the Cuban government, in full adherence to its national legislation and International Law. Among the most notorious aberrations, the aforementioned Title makes that authorisation extensive to owners that were not US citizens at the time when nationalisations were carried out and whose alleged properties no one has certified. By virtue of the very Helms-Burton Act, all US presidents since 1996, including Trump in 2017 and 2018, have consistently made use of the executive power to suspend the implementation of Title III every six months, for they have recognised that it is the most gross and unacceptable aspect of it, contrary to International Law and the sovereignty of other States; and also because they have realized that its implementation will bring about insurmountable obstacles to any prospective solution to claims and compensations to legitimate US owners. On November 2, 1999, Havana’s People’s Provincial Court, for its part, upheld the Demand against the US Government for Human Damages and sanctioned it to provide the Cuban people with reparation and compensation worth $181.100 billion dollars; and on May 5, 2000, that same court sentenced the US government to pay 121 billion dollars also for Economic Damages Caused to Cuba. The Ministry of Foreign Affairs has reiterated Cuba’s willingness to find a solution to mutual claims and compensations. This decision that the US government is threatening to implement would mean that, contrary to what is established by International Law and the praxis of international relations, foreign individuals and entities with legitimate businesses in Cuba could find themselves putting up with the threat of having to face up to unfounded claims void of legitimacy before the US courts. The politically motivated and venal behaviour of some courts in Florida, very often used as a weapon against Cuba, is too well known. We should all remember the aberrant contents of the Bush Plan which thoroughly describes and organises the way in which Cuban families and the whole country would be stripped of almost everything. For more than twenty years, the Helms-Burton Act has guided the interventionist efforts of anti-Cuban sectors in the US to attack the Cuban nation and undermine its sovereignty. By virtue of its implementation, hundreds of millions of dollars have been allocated to subvert Cuba’s internal order, and countless measures have been proposed to bring about a change of regime. Its economic impact has seriously affected the country’s development efforts as well as the population wellbeing. Its humanitarian impact has not been greater thanks to the social justice system that prevails in Cuba. The attempt to fully implement Title III has been promoted against the opinion of important US government agencies and as a consequence of the power and influence achieved within the government by persons whose political career has been marked by an impotent resentment against Cuba and relied on the use of lies and blackmail. Most of the US public opinion has consistently opposed the economic blockade, according to highly qualified polls. History records with sufficient clarity that neither the economic blockade policy nor the bilateral problems between Cuba and the United States originated from the fair nationalizations that were carried out by the revolutionary government, according to the law and its legitimate right. The US government military, economic and terrorist aggressions against Cuba started before the fundamental actions of nationalization of US properties started. It is a well-known fact that the nationalisation of all foreign properties, including American properties, included the legal commitment to pay a compensation, which the US government even refused to discuss, which was accepted instead by the governments of claimants from other countries, all of whom received an appropriate compensation. 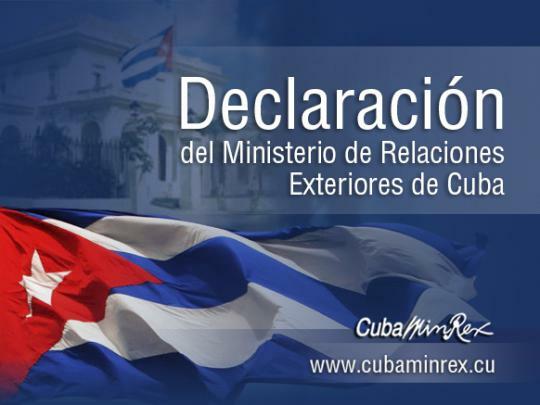 The Ministry of Foreign Affairs reiterates the postulates contained in the Law to Reaffirm the Cuban Dignity and Sovereignty (Law No. 80) and emphasises that the Helms-Burton Act is illegal, inapplicable and is void of any value or legal effect. Consequently, any claim filed under this law by a natural or juridical person, regardless of their citizenship or nationality, will be rendered null.